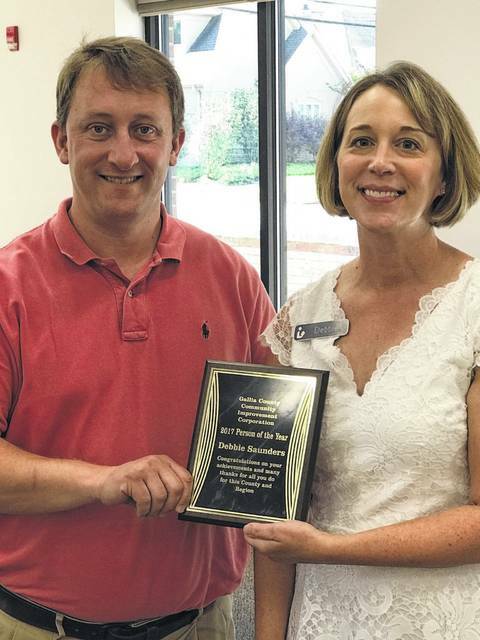 CIC President Josh Bodimer (left) presents Bossard Memorial Library Executive Director Debbie Saunders (right) with a Person of the Year award from the CIC. Bossard Memorial Library Executive Director Debbie Saunders facilitates the strategic planning session, with CIC President Josh Bodimer. 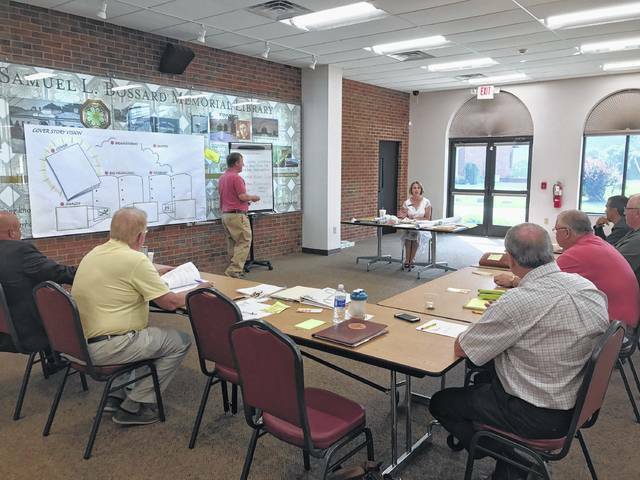 GALLIPOLIS — With the assistance of Bossard Memorial Library, the Community Improvement Corporation of Gallia County recently held sessions to develop a strategic plan for the organization. The CIC, developer of the Dan Evans Industrial Park, has served Gallia County for over 50 years, primarily through the development of properties. The board consists of a diverse group of city and county officials, as well as private citizens and business leaders. Josh Bodimer, recently elected the 2017-18 CIC president, said strategic planning will assist the organization, as it moves forward. Included in the goals, identified in the meetings were: improving quality of life through facilities and programs; developing current CIC owned properties; investigating the possibilities of an interchange off of U.S. 35 into the old Kessinger Farm property, now owned by the CIC; -developing public infrastructure, including county-wide high speed internet access. The strategic planning sessions were facilitated by Bossard Memorial Library Executive Director Debbie Saunders. Following the last session, Bodimer presented Saunders with a plaque, naming her the 2017 Person of the Year. “Having the opportunity to facilitate the CIC’s recent strategic planning sessions, provided me with not only a better understanding of the rich history and many accomplishments of the CIC, but also an understanding and appreciation for the vision and passion the members of the CIC have for Gallia County going forward,” said Saunders. The CIC was founded in 1964 by Marlin Kerns, Carl Bias, Gilbert Beard, Wayne Foster and John O’Dell, who believed providing Gallia County with solutions for economic development is not a one-time goal, but a continuing commitment to the creation, expansion and retention of business.